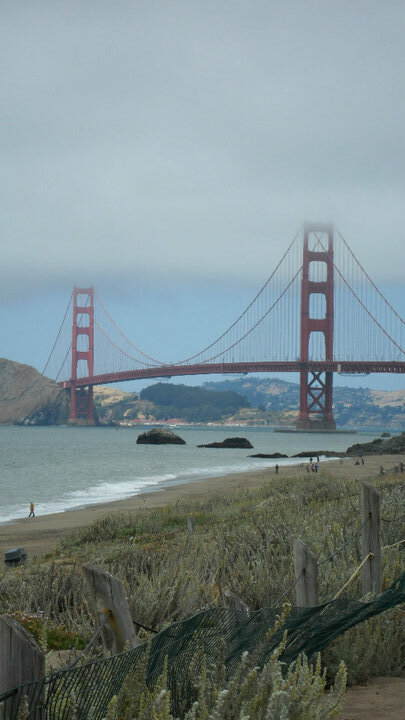 Bailey Dailies: If You're Going to San Francisco, Be Sure to Wear...a Parka?? If You're Going to San Francisco, Be Sure to Wear...a Parka?? We woke up FREEZING in San Francisco! I couldn't believe how cold it was during July--it made no since to me! After we got up we went out and immediately had to go back in and put on more clothes in order to survive the weather, which was very unusual for us, since it was 100 degrees when we left Alabama! Our plan was to hit all of the touristy highlights, since we only had one day in the city. 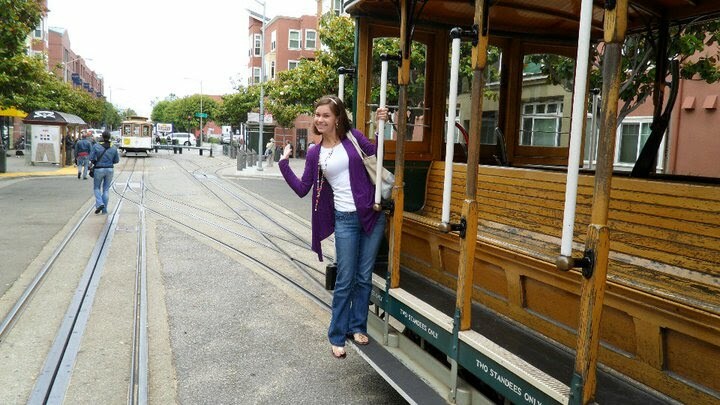 We jumped on a cable car and away we went. 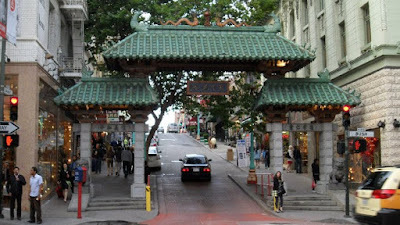 I ended up having to hang off the side, and while I did feel like I was in a Rice a Roni commercial and very authentic SF, I was pretty scared I would fall off or be hit by a passing car. I was basically smushing the kids next to me while Forrest was laughing and taking pics of me. 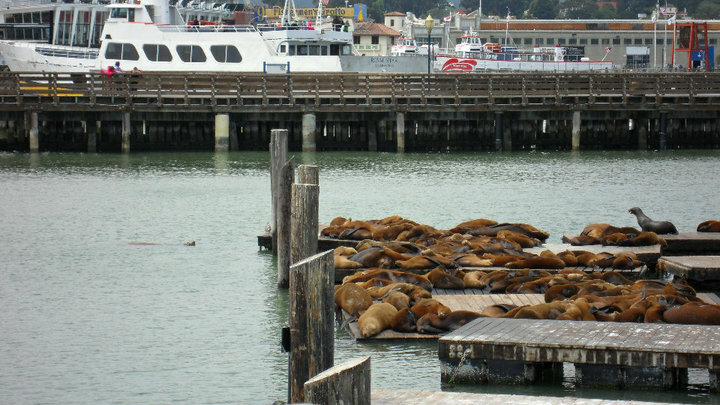 We made it to Fisherman's Wharf, the tourist district, and touristy it was. There were all kinds of shops selling "SF" hoodies and fleeces to tourists like myself who were freezing and had not packed the right clothes for their trip. I, unlike many of these people, choose to freeze rather than pay $40 for the awful things. We went to Pier 39 and shopped for a while in fun places like one store that only sold socks and another that sold left handed things like scissors and grill tools (which looked oddly like right handed grill tools, but who am I to know what left handed stuff looks like). There were several cool places where you could pick out an oyster with a pearl inside and the people would open it and clean your pearl for you. I did not do this, however. I was desperate to see the sea lions! They were much cuter than the elephant seals (even though not near as cute as the stuffed ones you could buy would suggest. It was neat to hear how they keep coming back to the same place year after year, for no apparent reason. After the seals, we decided the best way to see the city was to take a tour. 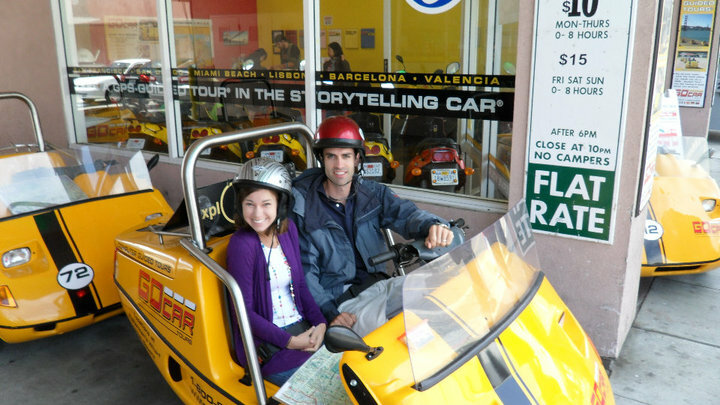 We had several options but we settled on renting a GoCar! It was like a little car/motorcycle that had a gps that told us where to go AND told us info about what we were seeing! It was totally cool! We were able to go at our own pace and stop and take pictures when we wanted to. We drove all over town! 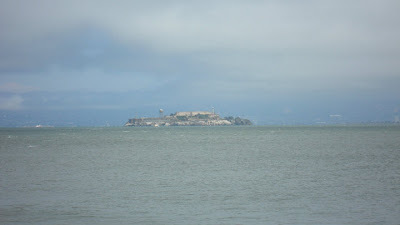 In the morning we drove along the beach and saw of course the Golden Gate Bridge and Alcatraz, which we found out was the most visited landmark in the US (although we didn't visit it). Even though I've seen the bridge in pictures, it is truly breathtaking! I mean is is just enormous! What a feat of engineering! I took so many pictures of it from as many angles as I could. I hope that we have one that is good enough to blow up and frame for our house! 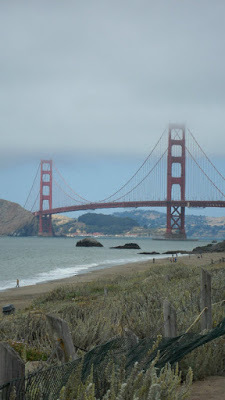 We got to see Baker Beach and China Beach, as well as several officers homes. We then drove through a really swanky part of town (where Robin Williams lives) and Lands End. 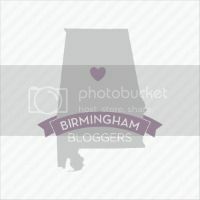 Who knew that was a real place? Our next big stop was the Painted Ladies, or the houses from the opening credits of Full House! I was so excited to see these, as Full House was my favorite show when I was a kid! 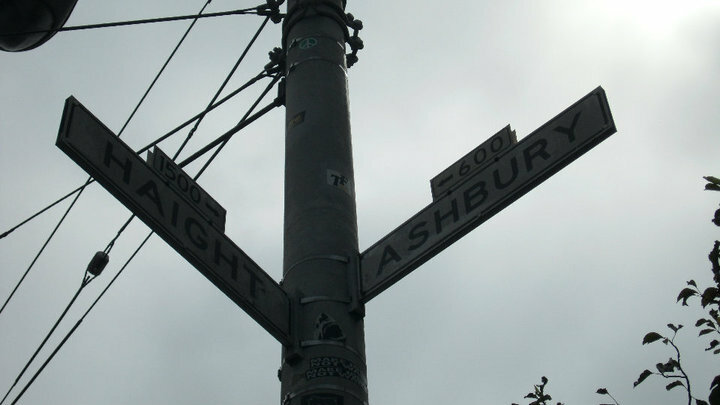 Next we were on to Haight Ashbury, the epicenter of the Counterculture. My American Studies teacher would be so proud of me! It was such an eclectic part of town and we really loved wandering up and down Haight Street. We saw the Grateful Dead house and Charles Manson's. Cool! I was FREEZING and ended up buying two sweaters (and a pair of yellow sandals) at a consignment shop. I was feeling very hip! We jumped back in the car for more. We got to drive down the "crookedest" street in SF, even though that really isn't the truth, and we saw Coit tower, the Exploratorium, and the church where Marilyn Monroe and Joe Dimagio had their wedding pictures taken. 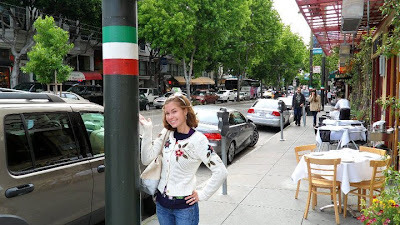 We did get lost on our way back, apparently because the tall buildings in SF interfere with satellite signals! We made it back all in one piece, though, albeit freezing! We then walked to China Town through the Italian part of town (which smelled delicious). We wandered the streets for hours. Forrest got a snack at the oldest bakery in town, where apparently Bill Clinton ate, and I got a "D & G" bag for a nice bargain! We were so tired after our packed day we went back to the hotel, ordered room service and watched our movie. Forrest picked out "Diary of a Wimpy Kid" because it seemed light hearted. It really did have us laughing uncontrollably! It is a children's movie but it reminded us of several people we know rolled into one! Again, we pretty much passed out that night, exhausted after a long day of fun!